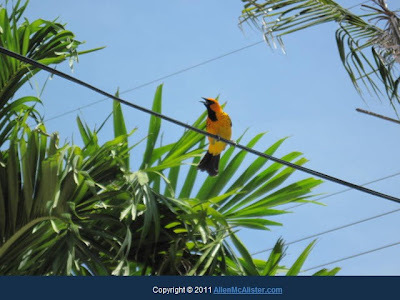 Allen's Adventures: The Baltimore Orioles are at my house! The Baltimore Orioles are at my house! Its birds with their young. About two weeks ago this really pretty birds showed up. Black and orange with an really cool song they chirp. 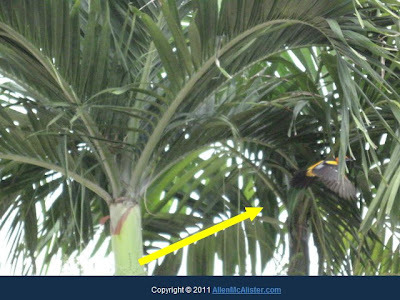 They built a nest in the palm tree next to our deck. This morning when i went out to the deck, as soon as I step outside, I thought my ears were ringing, but it was the babies screaming for their parents, which was out getting food. I have been watching them for the better part of a day. Both parents are doing their part. So far I have seen them attack a blue jay and a cardinal. Chasing them from tree to tree and branch to branch. 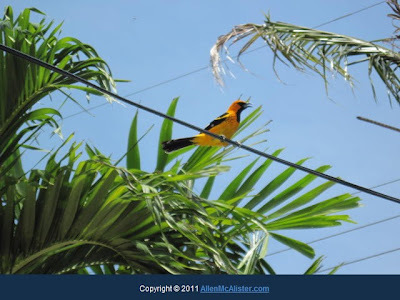 The Baltimore Oriole (7-8.25”) is bright orange bird with black hood and back. Wings are black with orange shoulder patches and strongly white-edged feathers that appear as bars. Female has an olive brown back, yellow/orange underparts and white-edged feathers on the wings. Juvenile is paler overall and has gray belly and the first year male has black throat patch. If you want to know more about the Baltimore Orioles then click the link. It will tell you more details. I really like the in flight pictures. I am going to take pictures every day until the family of birds fly away. and Keep you posted. It's a BEAUTIFUL bird! 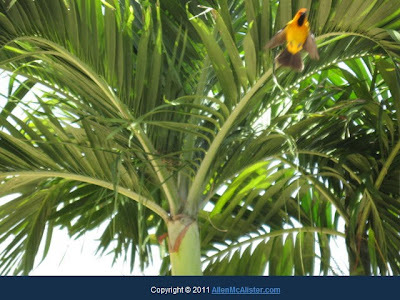 The pictures of it, the palms, and blue sky make it look like a tropical paradise. Thanks for showing us the pictures and video. They made me smile at the beauty of God's creation. You are so lucky! 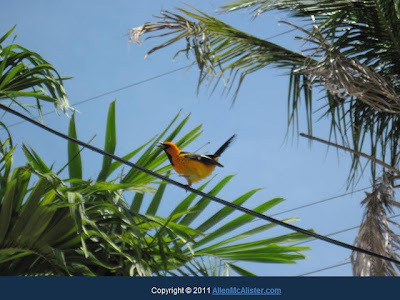 I've had the pleasure of spotting only one Oriole in my entire life. Those are great photos, Allen! I love Orioles! Allen, great pictures. I never have much luck getting them on film. Must have been such a great surprise.